The Haunting of RF398 - office23s jimdo page! No one is sure why the Avro Lincoln bomber, serial number RF398, should be haunted. The Avro Lincoln was first flown on 9th June 1944, it was to be the last piston-engined bomber to serve with the Royal Air Force. Entering into service to late to take part in the Second World War the Avro Lincoln did see combat in two colonial insurgencies in the 1950s, the Mau Mau Uprising in Kenya and the Malayan Emergency, before being phased out of service with the Royal Air Force. The Avro Lincoln saw limited service with Canada, Australia and Argentina until 1967; others were converted to tankers for inflight refuelling and transporters. RAF Cosford - Avro Lincoln B2, RF398. An Avro Lincoln B2, RF398 forms part of the 'War Planes' collection at RAF Cosford where it arrived for 'storage' in the late summer of 1968. 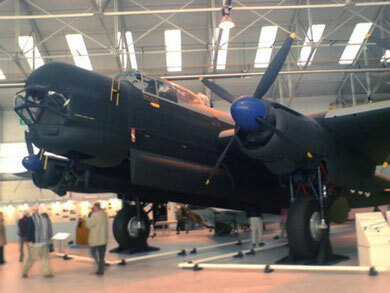 RF398 first flew on 11th September 1945, but, following a large number of modification did not reach a flying unit (Bomber Command Bombing School) until 1952, nearly two years after the withdrawal of Avro Lincoln's from frontline service. 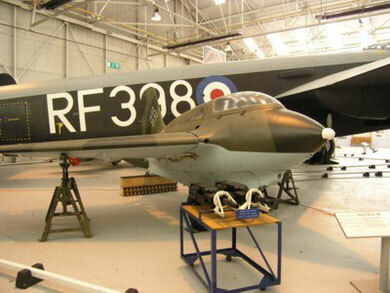 On the 30th April 1963 Flt Lt John Langley flew RF398 on the penultimate RAF Lincoln Flight from RAF Watton to RAF Henlow for storage for the RAF Museum. Touching down at 15:25 the final flight closed RF398's career of 1043.05 flying hours and 792 landings. 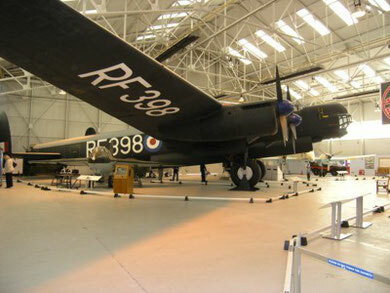 RAF Cosford - Avro Lincoln B2, RF398. (Neil Tipton). Since those first encounters a number of people have reported seeing an airman in battle dress in the hangar and some have reported seeing a head in a flying helmet in the observation dome of the aircraft. Other happenings include the movement of objects, temperature variations inside the aircraft and the sound of footsteps in the vicinity of the aircraft. One visitor to the museum in 1980 reported seeing a fair haired man in a white polo neck sweater and forage cap seated in the cockpit of the plane. In 1984, the phantom pilot was even spotted by a cameraman working on an edition of the T.V. programme 'Wish You Were Here'! In 1991 a BBC team, ('Strange Stories: The Haunting Of RF398' - first broadcast BBC Radio 4 16th February 1991), investigated reports of mysterious goings on around the Lincoln during which they managed to record some of the spooky sounds that had been heard in the hangar. More recently the secretary to the museum society was busy preparing a notice board about the Avro Lincoln when she heard her name being called. Thinking it was one of the museum staff calling her she looked first toward the Lincoln and then toward the door but saw no one. Naturally, to this day she will not enter the hangar alone. RAF Cosford - A Messerschmitt Me 163 in front of RF398. Perhaps the most amazing encounter occurred when an electrician, working fifteen feet above the hanger floor, when he suddenly fell. As he tumbled downwards he remembers thinking "this is it" because he had already injured his spine in a similar fall from another aeroplane. But instead of hitting the concrete floor with expected force he floated to a stop "as if", he said, "some invisible force had prevented his fall from being fatal". Researcher Ivan Spenceley, along with members of the Chesterfield Paranormal Research Group, investigated the haunting in 1987. On this occasion a tape machine was left recording inside the Lincoln whilst the investigators departed from the hanger ensuring nobody remained behind. When they returned some 40minutes later they found the perspex lid of the tape machine lifted, the two reels removed and the tape spread about the cockpit like spaghetti! Over the next 4 year Spenceley visited Cosford and FR398 some twenty times amking a number of recordings of muffled voices, droning engines, tappings and rappings. (Recordings that were to be the basis for the aforementioned BBC documentary). More recently doubts have been cast upon the recordings and investigation made by Ivan Spenceley, veteran researcher and founder of the Chesterfield Paranormal Research Bureau, Michael Hicklin stated that Spenceley's claims "were entirely fraudulent." Following the BBC programme of 1991 permission for further investigations by individuals and groups were declined. This however has not stopped odd encounters - In March of 2002 a Security Guard at the museum experienced 'something strange' in the vicinity of RF398. Many people have taken a great interest in the ghost; spiritualists claim the phantom sings to them, others that he is a wartime airman taking up residence in the peacetime aircraft. Could it be the ghost of Master Pilot Hiller who loved the aircraft saying on his last flight that he would "haunt his baby". Hiller was unfortunately killed near Cosford in an air crash.